Added by Indo American News on May 24, 2018. Key Note speaker NASA astronaut Sunita Williams and Chief Guest, Consul General, Dr. Anupam Ray received awards from FIS Chair, Krishna Vavilala. HOUSTON: The Indo-American community gathered on Saturday, May 12 afternoon at the Jungman Neighborhood Library to celebrate their culture. 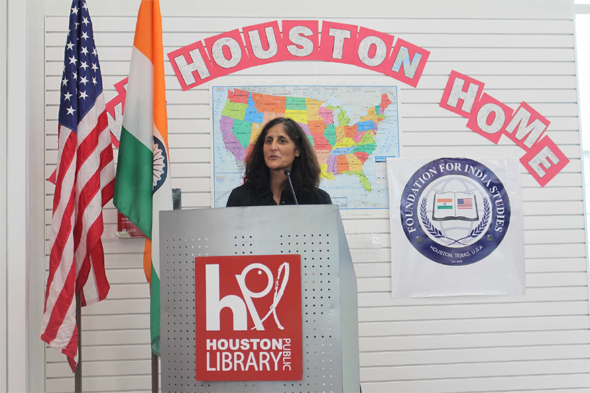 The event, which showcased the art, food, culture and spirit of the Indian subcontinent, was presented by the Houston Public Library (HPL) in partnership with the Foundation for India Studies (FIS). 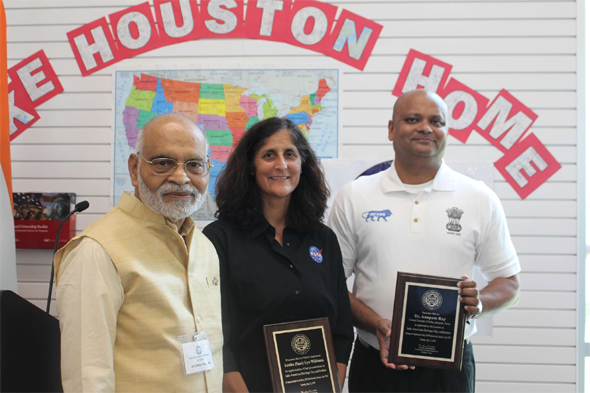 The keynote speaker was NASA astronaut of Indian descent, Sunita Williams, and the guest of Honor was Dr. Anupam Ray, Consul General of India in Houston. The program began with a traditional Indian dance performed by Soujanya Madhusudan, Associate Director of Bharatha Darshana School of Indian Dance & Music, followed by remarks from Jennifer Schwartz, Manager of Programming for the Houston Public Library. Then, Krishna Vavilala, FIS founder and chairman, introduced Dr. Ray. 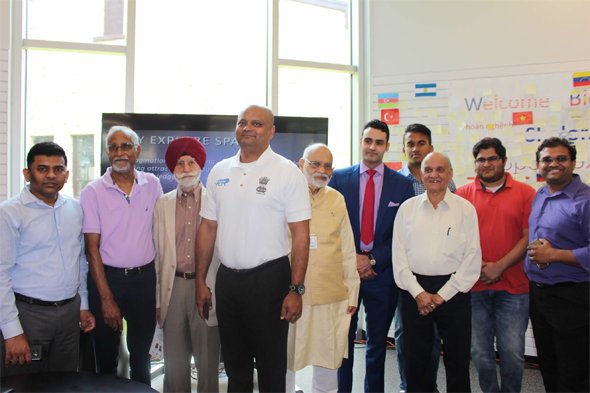 FIS supporters, friends and Board members with Consul General, Dr. Anupam Ray. HPL Program Manager Jennifer Schwartz then introduced the keynote speaker, Sunita Williams. Ms. Williams, who was accompanied by her father, Dr. Deepak Pandya, delivered an engaging speech focusing on what she has learned throughout her time in space. Ms. Williams spoke about how she joined the US Navy and became an astronaut and how she, who has an Indian father and a American mother of Slovenian descent, is truly “Indo-American” in every sense of the word. Her speech detailed the unique lessons she learned while looking at the earth from the space, especially her focus and interest in the unique human message. She remarked that, fundamentally, far more things unify us than divide us as a species, and that for her, going to space is emblematic of this truth. She also recalled the unique challenges presented by operating on the International Space Station, and then devoted some time to discuss NASA’s future plans for space exploration. Ms. Williams Indian astronaut Rakesh Sharma, late astronaut Kalpana Chawla, and NASA’s fresh Indian American recruit, Raja Chari, a Lieutenant Colonel in the US Air Force. A short Q&A session followed and then Mr. Vavilala presented FIS mementos to both Sunita Williams and Dr. Anupam Ray. Helen Chou and Jennifer Schwartz, of HPL managed and Emceed the 4-hour long program that also included an interactive Q&A session with the astronaut. FIS introduced a variety of new items in this year’s Heritage Day celebration, including an oral recitation and explanation of the Vedas by Sitaram Ayyagari; a lecture demonstration explaining expressions and various mudras of Indian dances by Pallavi Kumar, founder of Laasika School of Dance; live painting and display of Madhubani paintings from Mithila, Bihar by Tanushri Misra assisted by her husband Amaresh; and dances by students of Bharata Darshana School of India Classical Dance and Music. About 30 kids participated, wearing regional dresses of different states of India. Other cultural presentations included Telugu and Hindi songs were sung by Telugu children brought up in this country, organized by Sunil Kommineni; and an India-BEE fun quiz conducted by Soundarya Sahoni, which attracted a number of participants, young and old who tested their knowledge about India and were rewarded with small gifts. 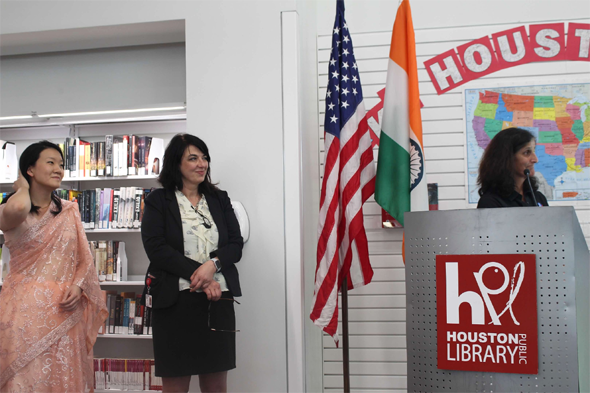 The Indo-American Heritage Day was presented by the Houston Public Library under its new series called the Living Room at HPL. It is all about neighbors meeting neighbors and getting to know each other in an informal living room setting and promote meaningful conversations across communities, said Jennifer Schwartz the overall program Manager. Key Note speaker NASA astronaut Sunita Williams. For full video coverage of the Indo-American Heritage Day, please visit the FIS Facebook page.